Hutment sections for Marion Island's buildings being floated ashore. Photo: Lt. W. L. C. Bond. WHEN we returned to the landing beach we found great activity there. Within a few minutes of anchoring, the Gamtoos had begun putting her special boats over the side, and since then all hands had been employed unceasingly, except for the break during the night, in transferring her cargo ashore. The guano boats were loaded alongside the Gamtoos with the aid of the ship's derricks. The motor-boat, the Aqua, was used only for towing the guano boats to within a short rowing distance of the landing-stage. It dared not go too close owing to the kelp that was floating in the shallow water. The crew of five Coloured men in the guano boat would haul alongside the landing-stage with the aid of a strong guide rope made fast to a rock at the shore end of the catwalk and running out parallel with the landing stage to an anchor a little distance seaward. As soon as the craft was in the correct position one of the crew would take a swift turn of the rope round a bollard in the boat, and all hands would then begin bundling the packages from the boat on to the landing stage. The waiting soldiers seized them and passed them from hand to hand down the catwalk to the shore. The whole operation had to be done smartly with the boatmen keeping a constant watchful eye seaward. There was always danger that a wave larger than usual would surge round the Point and catch them under the landing stage, with risk of an immediate capsize, or that it would tear them from their moorings and cast them on to the rocks only a boat's length ahead. They dared not moor too securely else they would not be able to slip quickly and pull seaward to comparative safety. stage the other would be loading alongside the Gamtoos. When she dropped the loaded boat near the stage, the Aqua would pick up the empty boat and take it back to the ship. When the hutment sections were reached, the Gamtoos's men would lower them overboard into the sea, where they floated. They would be made fast astern of the loaded boats, two at a time, and so towed shoreward. The shore party built a rough slipway of baulks of timber, and mounted a hand winch on rising ground behind the beach. They were thus able, slowly and laboriously, to haul the heavy hutment sections out of the water. Later they extended their slipway and dragged the sections right up the shoulder of the cliff to the top of the ridge at the base of Gunner's Point. This had been chosen as the site for Snoektown Settlement. The landing of the Gamtoos's cargo was necessarily slow, for the rowing boats could take only a few tons each at a time, and as the ship had about 400 tons to put ashore, it seemed as if this method of discharge was like using a teaspoon to empty a bath of water. It was, however, the only one that seemed practicable in the circumstances. Everybody who could be useful on the job was employed on it, and ashore the entire occupation party was concentrated on clearing the landing stage and slipway as speedily as possible of the cargo brought by the guano boats. All knew that the Gamtoos had fuel enough for only a limited period and that it was essential to take full advantage of what favourable weather came their way. been warned not to risk being marooned on Marion in case we missed the opportunity of landing on Prince Edward, so we caught the last boat back to the Gamtoos. The night was a stormy one, and daylight found us in a heavy gale, out of sight of land, and with no sign of the Natal. The sky was overcast all morning, and Finlayson was unable to get a sight to enable him to fix our position. By dead reckoning we knew we should be to the eastward of the island. During the morning we made contact by radio with the frigate, and learned that she, too, was not certain of her position. About the middle of the afternoon the weather improved, and both ships turned westward to look for the islands. The Natal found them first and gave us a direction-finder bearing which enabled us to return to our anchorage in Transvaal Cove early in the evening. The frigate followed us in. By dark the weather was again perfect, but landing was out of the question because of the tremendous swell which battered the entire coastline, throwing spray 100 feet high to the level of the cliff tops. 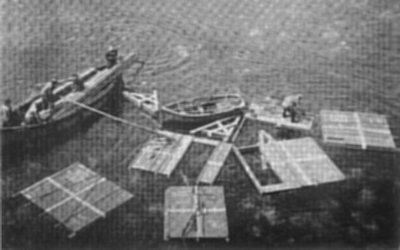 All the next day the swell continued to rule out the use of the landing stage, but the Gamtoos was able to float some of the hutment sections ashore. I spent most of the day watching the operations through glasses from the ship's bridge. Dike waited all day for an opportunity to come off to the ship for a conference about his immediate requirements ashore. Eventually he sent a radio message to say that if a boat could not take him off the landing stage he would slide down a rope hung from a ledge on the cliff face in a cove near Gunner's Point that was sheltered from the worst of the surf. A boat went in at some risk, and he dropped down into it though not before he had been thoroughly drenched. After the conference he went back the way he had come. stage, though it narrowly escaped being thrown on the rocks in the attempt. Dymond sent his boat to take Sara and me to the frigate so as to be ready for an early start on the morrow for Prince Edward, should the weather be favourable. In the swinging cots of the warship's sick bay we spent our most comfortable night since leaving Cape Town. The weather was most promising the next morning. Kruger joined us, and after breakfast we set off for the other island. The passage took about an hour. We found Prince Edward clear of clouds and mist and concluded that this must be one of its best days. It looked almost attractive, but though I did not then know how closely it was associated with disaster and tribulation, there seemed something sinister about it. It was more rugged than Marion, and viewed from Cave Bay its appearance was suggestive of its having been shaped in torment. Its sky-line was pimpled with conical hills, their level summits suggestive of extinct volcanoes. One such double-summited hill framed the right-hand side of the bay. The whole of its inner side bore a ghastly reddish-brown scar where the green vegetation that fringed its face had been shaved off as with a razor. Only molten lava could have cut so clean a mark of delineation. And closer examination revealed a similar line, just as sharply cut, higher up one slope. It indicated that the earlier overflow had not been as extensive - on this side at least - as the more recent one. Stretched across the head of the bay was a long ridge with a perpendicular rock face, and half-way along its base was the great black entrance to a cave. Further to the left a landslide long ago had provided a slope to link the rocky beach in front of the cave with the top of the ridge behind, and had incidentally left a giant, sharp-edged spur thrusting skyward like the prow of a ship. The closer one approached the more desolate did the appearance of this land become. The principal reason for this visit to Prince Edward was to complete the formalities necessitated by international law for the annexation of the territory. Fairbairn had 20 days previously taken the first step by formally claiming the territory for the Union of South Africa. The Government of the Union had now publicly to associate itself with the claim made on its behalf by one of its nationals. This was now to be done by reading before witnesses, on the territories concerned, Proclamations announcing the establishment of effective occupation and administration over them. At the same time the South African flag was to be ceremonially raised. The ceremonies were to be publicised as widely as possible by Press, radio and film so that the world should be cognisant of South Africa's claims. Sara and I were responsible for initiating the publicity and making photographic records which would go into the files of the Department of External Affairs to help in substantiating the Union's claim to possession, should it be queried later. by His Excellency the Right Honourable Gideon Brand van Zyl, a member of His Majesty's Most Honourable Privy Council, Governor-General of the Union of South Africa. Now, therefore, by virtue of the powers vested in me by Section Six of the Royal Executive Functions and Seals Act, 1934, I do hereby proclaim and declare that His Majesty's sovereignty of. Marion Island and Prince Edward Island is henceforth to be exercised by His Majesty's Government in the Union of South Africa. Given under my Hand and the Great Seal at Cape Town this twelfth day of January, One Thousand Nine Hundred and Forty-eight. (Sgd.) J. C. Smuts, Prime Minister. The Proclamation read, Dymond placed it at the foot of the flagstaff. While the guard presented arms and the officers stood at the salute, the Union fag was run to the masthead. Thus was completed the last legal requirement for establishing South Africa's right to possession of the island. Now everybody adjourned to the entrance to the cave, where Schott mysteriously produced a case of champagne, and toasts were drunk to the future of South Africa's first colony. While I photographed the cheerful drinkers I could not help recalling the fare upon which the previous inhabitants of this island -sealers and castaways - had existed. Not even in their most irrational dreams, I thought, did they imagine champagne flowing here! The Natal's landing party were perhaps more appreciative of this liquid refreshment because they had not won it easily. It was true that the Gamtoos had brought five cases of it from Cape Town, especially sent at the direction of one in high authority for this occasion. The Gamtoos's complement had taken great care of the consignment, even unshipping the bridge companion-way in order to stack the cases in the well beneath it, and then screwing the companion-way in place again. Thus they had kept the consignment under ceaseless surveillance from the bridge and safe from thieving hands and sweeping seas. But having brought it safely to its destination they had shown some little reluctance to part with it. Dymond had had to send an unofficial boarding party to the Gamtoos to ask politely but firmly for one or two cases that he knew were missing from the consignment. But when the last was delivered up he carefully apportioned a share to every man afloat and ashore. different directions in order to cover as much ground as possible. I found Prince Edward's vegetation no different from that of Marion, though on the whole the ground seemed less soggy. There was a fair amount of sandstone, and in its vicinity, most noticeably at the base of the cliff, there was brown soil. As on Marion there was no level place larger than a football field to be seen anywhere. Along the crest of many of the slopes running down towards the sea was a ridge of decomposing lava rock that looked like a black river rising out of the carpet of green vegetation. I crossed several of these outcrops and found them to average about five feet in height and 15 feet in width, and to consist of thousands of pieces of small, loose, cindered stone piled up just as if they were coal heaps. Our brief survey revealed nothing else of note except that Grindley was able to satisfy himself by close examination that there was now no sign of steam or smoke issuing from the spot where he and others aboard the Transvaal had observed these phenomena three weeks previously. He climbed up the donga to the place that he had marked in his mind's eye, but the only sign of possible subterranean activity that he could find was what looked from above like a long fissure in the side of the donga about two feet down from the top. There was no foothold, however, to enable him to climb down to that level for a closer inspection. He came away still convinced that what he and his shipmates had seen from the Transvaal had been proof that Prince Edward was still volcanically alive. bottom and tripod legs. It looked like an oversized cooking pot of the type used by South African Natives for their open-air fires. Obviously, however, it was a try-pot that had been used by sealers, and it must have been here many years, for the rust was thick on it. Inside were a few decomposing bones and skulls of sea-elephants. Floating in the water around were several sea-elephant skins. With a piece of driftwood I turned one over and found that the inside was white and blood-streaked, as if it had been cut but yesterday. But when I lifted it out of the water it tore in pieces from its own weight. There was nothing to indicate how long the skins and the pot had been there or the circumstances in which they had been left there. All that was fairly certain was that the unknown workers had taken their departure from the cave at least a third of a century previously since no landing on Prince Edward had been recorded since before the First World War. Try-pots are irreplaceable down there, and the sealers that left this one behind must have intended returning for it later. But the bones inside and the skins nearby suggested that whoever had used it last, whether sealer or castaway, had left hastily. That cave had looked to me at first glance an evil place. But those signs of one-time human occupation reminded me that this very cleft in the rock had, at different times, sheltered desperate shipwrecked survivors.